Multiple drive “failures” is the common issue faced by many DELL servers running RAID arrays. So, today we will discuss those common issues as well as, the options of hard drive recovery. Here we will consider the things that you should take care of before trying to build a failed Dell RAID server array. And also the software options that may help you to build a virtual array to get back your lost data from the array. There are many people who love their Dell computers even if it’s years old. Dell has gained a quality brand name that is trusted by millions. 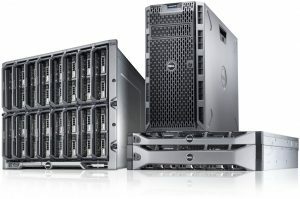 Even the small business servers of Dell come with great features, with great hardware and support. However, there is one area where the Dell servers have come up short of their quality standard and that is, RAID controllers. Now the question is how to do hard drive data recovery on a Dell server that RAID has failed and more than one drives have gone offline. So below there are some basic steps to attempt data recovery. Many of us are tempted to skip this step. But DON’T, because it is very important that you clone your drives first. Most probably there is at least one drive in your RAID which has bad sectors and that may completely fail if you skip this step. There are many options to clone a hard drive like using a hard drive reader, but ddrescue Linux is the only one that stands a good chance to handle hard disks with multiple bad sectors. If your drives cannot be cloned using ddrescue than you may need professional hard drive recovery service to do the hard drive repair to a point from where the data can be extracted. This may not be an easy process if you haven’t done it earlier. You will need to find the correct drive order, parity layout, stripe size, array offset and more to build a functioning array. With a little experience, this process will become more of a trial and error to deduce the right settings. The software, R-Studio have a feature to ‘auto detect’ the array setting, but it rarely works. Still, it may help you to get a starting point before starting for adjusting settings manually. Don’t ever save your data back to the drive you are recovering your data from. Any writes to your drive will destroy other data, especially if the settings are not correct. So it’s extremely important that you at least temporarily extract your data to another large drive. Also, you can create an image of the whole array for later use. This will help you to recreate the array just as before (it will help if you needed to boot the server). Once you are sure that you have all the necessary data and they’re all good data, not improperly striped or shifted data, you can then use a new array using the old or new, but working hard drives. Then you need to copy the data back over to the new array. Data Doctor offers data recovery services to recover data from your failed Dell Server RAID and also helps you to recover deleted files. We offer a comprehensive resource for Dell RAID recovery and RAID repair. We are well versed with all types of Dell Server and are able to recover data from hard drive and RAID configurations like RAID 10, RAID 5, RAID 1, RAID 0, RAID 50, RAID 51 etc. You can call us directly to talk to our server data recovery engineers.